Download "Cafcass and Independent Reviewing Officer. Protocol for Public Law Work. Independent Reviewing Officer"
7 Appendix 3 This is the final version of the Cafcass IRO Practice Note issued April This replaces the Practice Note dated May CAFCASS PRACTICE NOTE 2011 CAFCASS AND THE WORK OF INDEPENDENT REVIEWING OFFICERS 1. 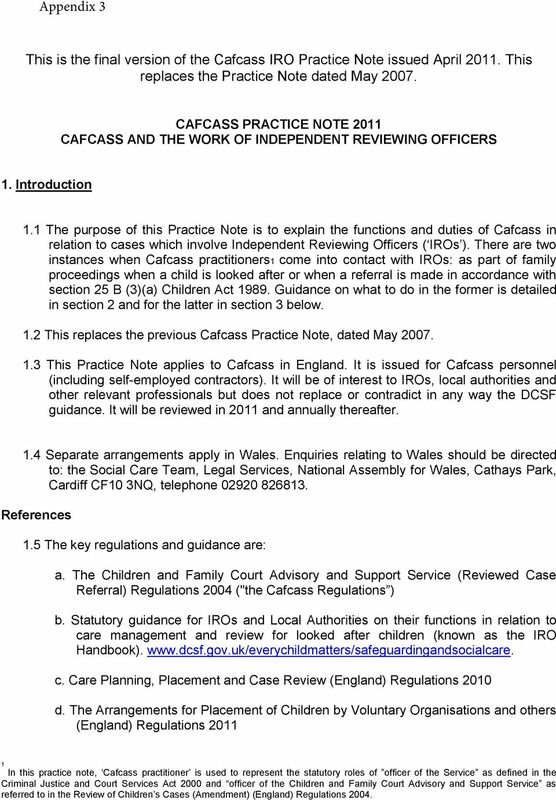 Introduction 1.1 The purpose of this Practice Note is to explain the functions and duties of Cafcass in relation to cases which involve Independent Reviewing Officers ( IROs ). 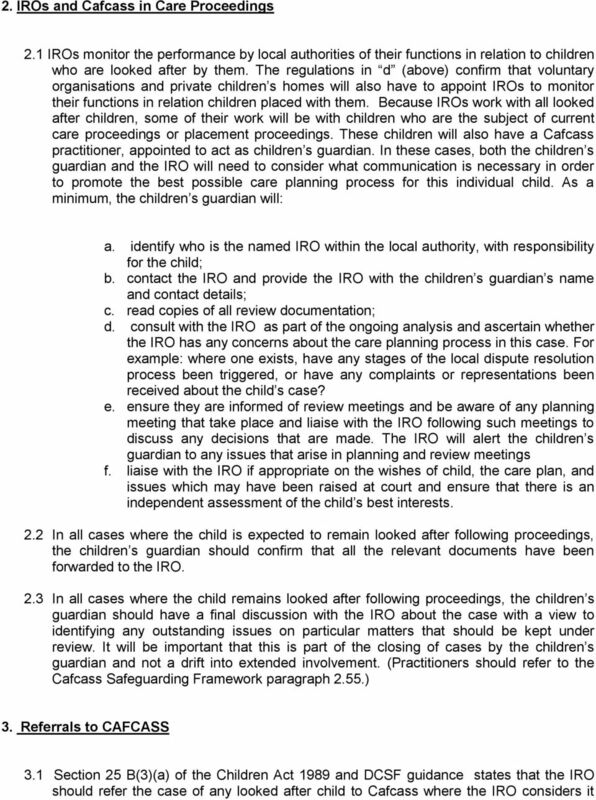 There are two instances when Cafcass practitioners1 come into contact with IROs: as part of family proceedings when a child is looked after or when a referral is made in accordance with section 25 B (3)(a) Children Act Guidance on what to do in the former is detailed in section 2 and for the latter in section 3 below. 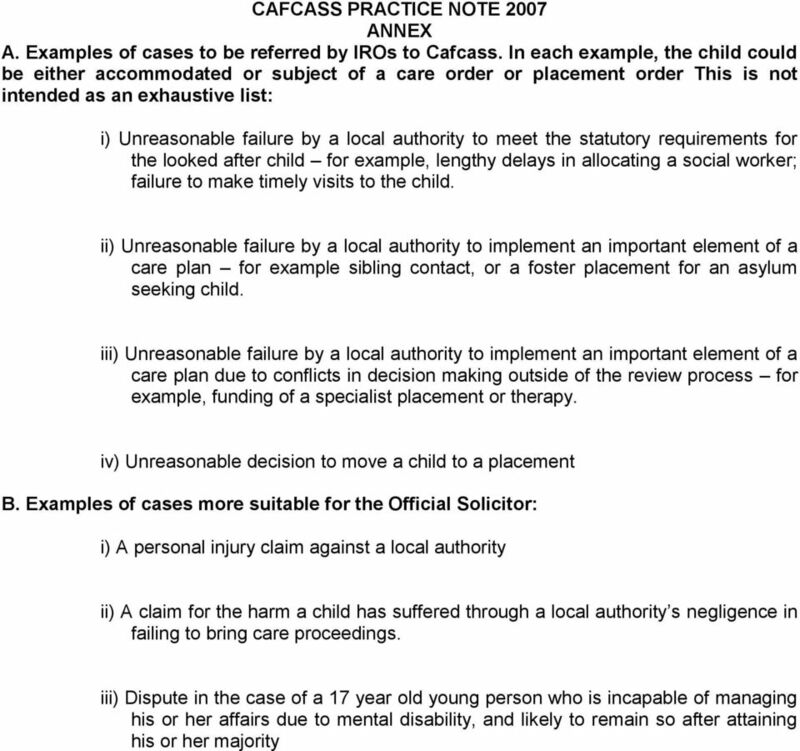 1.2 This replaces the previous Cafcass Practice Note, dated May This Practice Note applies to Cafcass in England. It is issued for Cafcass personnel (including self-employed contractors). It will be of interest to IROs, local authorities and other relevant professionals but does not replace or contradict in any way the DCSF guidance. It will be reviewed in 2011 and annually thereafter. 1.4 Separate arrangements apply in Wales. Enquiries relating to Wales should be directed to: the Social Care Team, Legal Services, National Assembly for Wales, Cathays Park, Cardiff CF10 3NQ, telephone References 1.5 The key regulations and guidance are: a. 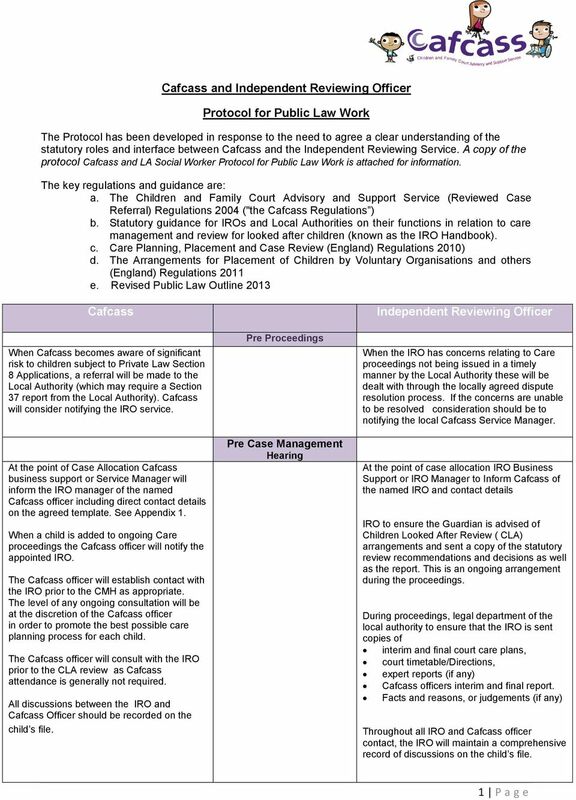 The Children and Family Court Advisory and Support Service (Reviewed Case Referral) Regulations 2004 ("the Cafcass Regulations ) b. Statutory guidance for IROs and Local Authorities on their functions in relation to care management and review for looked after children (known as the IRO Handbook). c. Care Planning, Placement and Case Review (England) Regulations 2010 d. The Arrangements for Placement of Children by Voluntary Organisations and others (England) Regulations In this practice note, Cafcass practitioner is used to represent the statutory roles of officer of the Service as defined in the Criminal Justice and Court Services Act 2000 and officer of the Children and Family Court Advisory and Support Service as referred to in the Review of Children s Cases (Amendment) (England) Regulations 2004. 9 appropriate to do so. The IRO must consider the impact on the child of a referral and make a decision based on the timetable for the child. There will be some cases where there will be time available to pursue the full dispute resolution process but this may not always be the case. 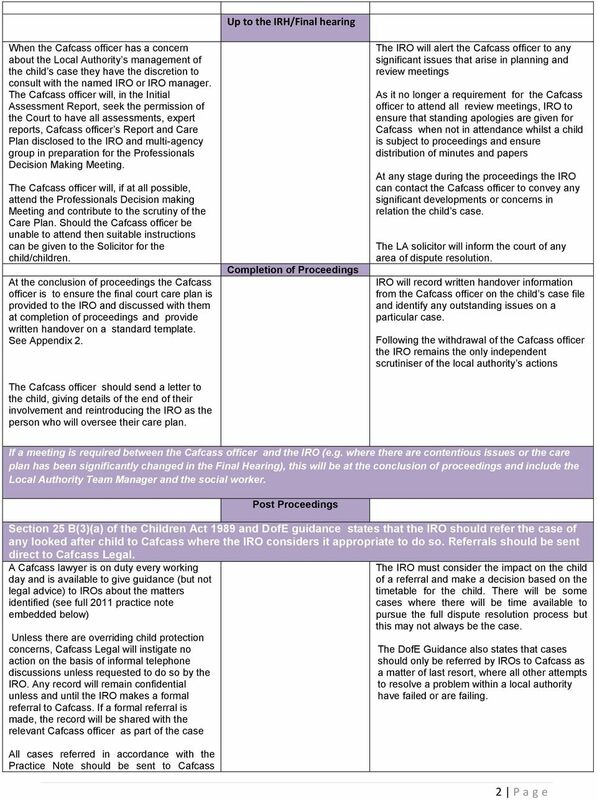 3.2 A Cafcass lawyer is on duty every working day and is available to give guidance (but not legal advice) to IROs about the matters dealt with in this Practice Note. (See paragraph 5.1below for contact details). 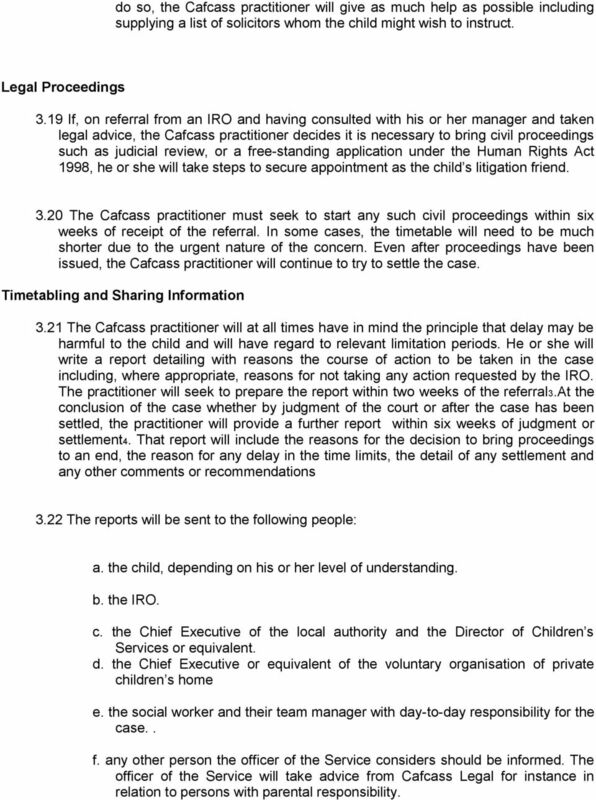 Unless there are overriding child protection concerns, Cafcass Legal will instigate no action on the basis of informal telephone discussions unless requested to do so by the IRO. Any record will remain confidential unless and until the IRO makes a formal referral to Cafcass. If a formal referral is made, the record will be shared with the relevant Cafcass practitioner as part of the case. 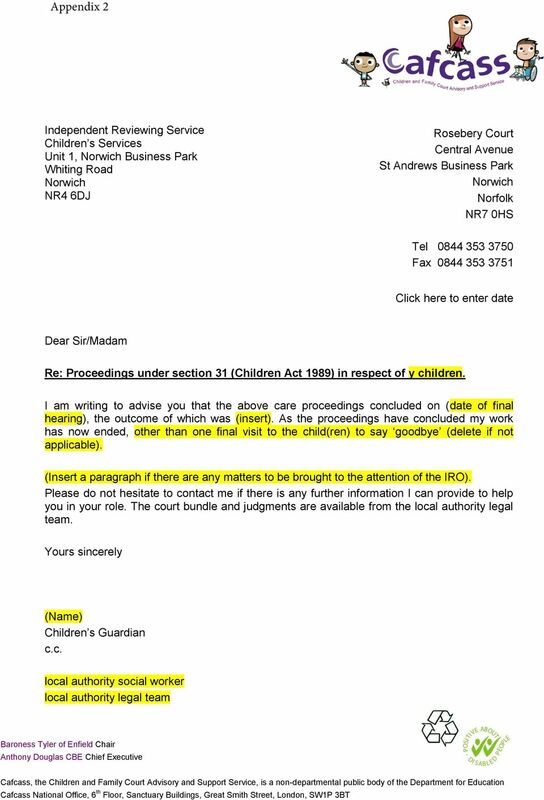 3.3 A Cafcass practitioner is only authorised to bring judicial review proceedings or free standing applications under the Human Rights Act 1998 by virtue of section 25 B(3)(a) of the Children Act 1989 and the supporting regulations referred to above. 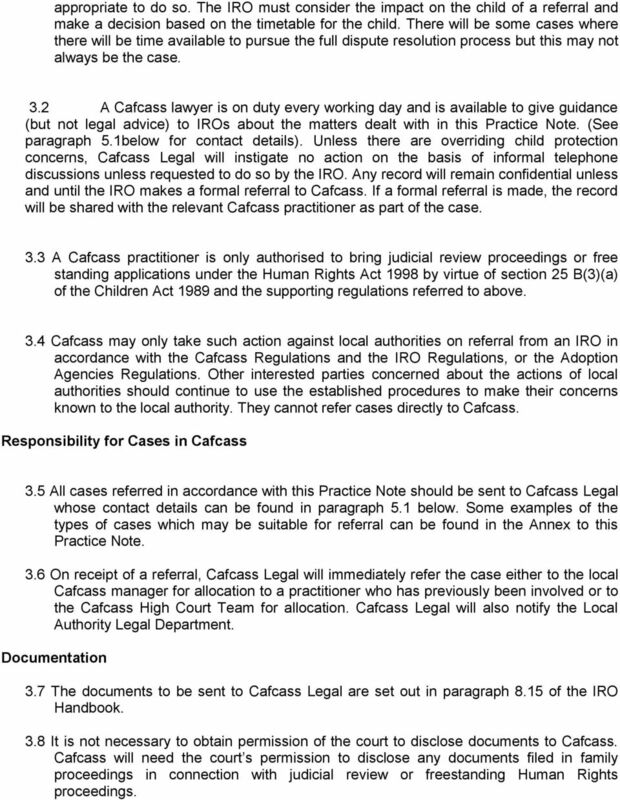 3.4 Cafcass may only take such action against local authorities on referral from an IRO in accordance with the Cafcass Regulations and the IRO Regulations, or the Adoption Agencies Regulations. Other interested parties concerned about the actions of local authorities should continue to use the established procedures to make their concerns known to the local authority. They cannot refer cases directly to Cafcass. 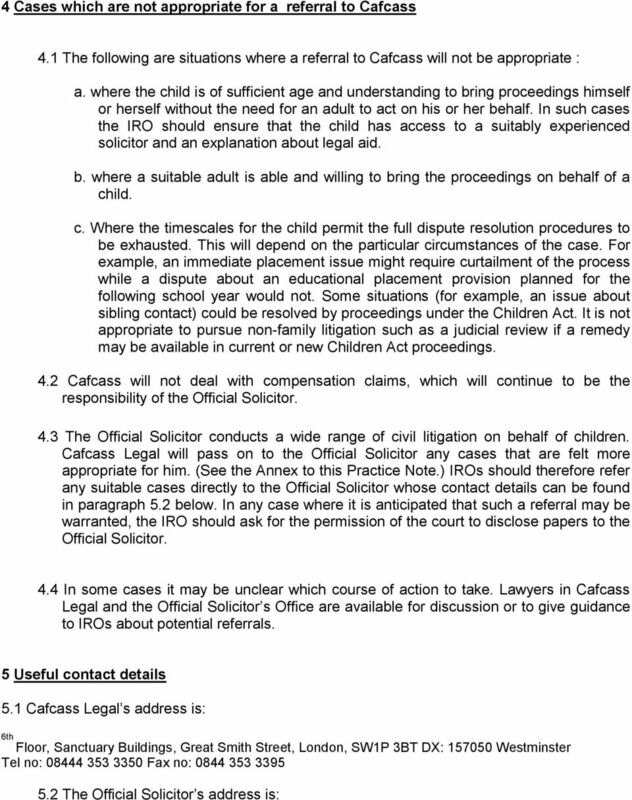 Responsibility for Cases in Cafcass 3.5 All cases referred in accordance with this Practice Note should be sent to Cafcass Legal whose contact details can be found in paragraph 5.1 below. Some examples of the types of cases which may be suitable for referral can be found in the Annex to this Practice Note. 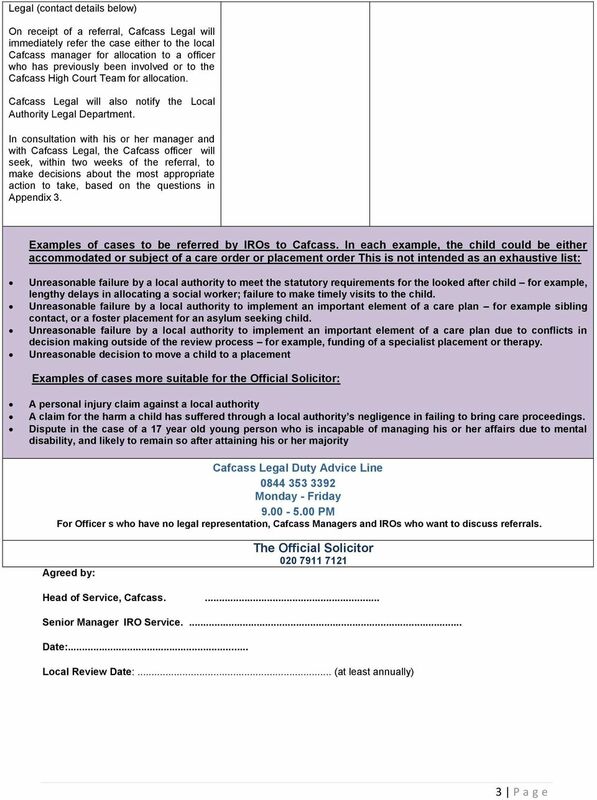 3.6 On receipt of a referral, Cafcass Legal will immediately refer the case either to the local Cafcass manager for allocation to a practitioner who has previously been involved or to the Cafcass High Court Team for allocation. Cafcass Legal will also notify the Local Authority Legal Department. 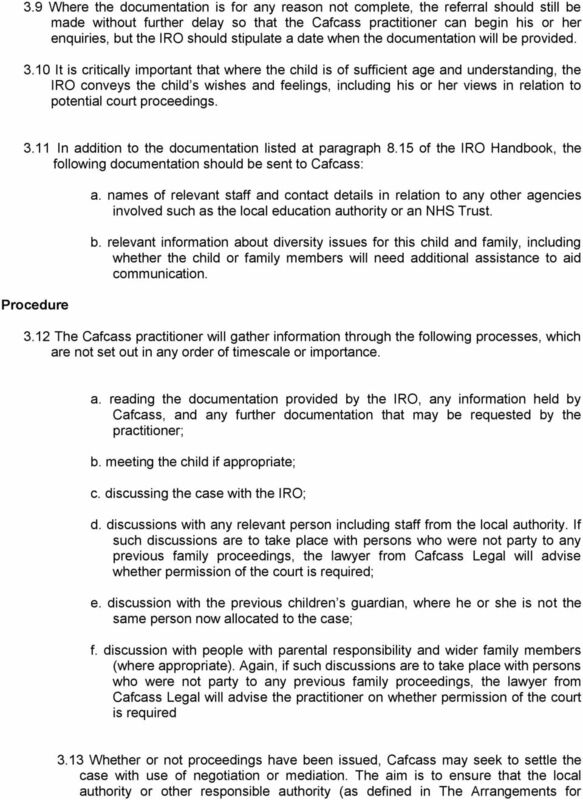 Documentation 3.7 The documents to be sent to Cafcass Legal are set out in paragraph 8.15 of the IRO Handbook. 3.8 It is not necessary to obtain permission of the court to disclose documents to Cafcass. 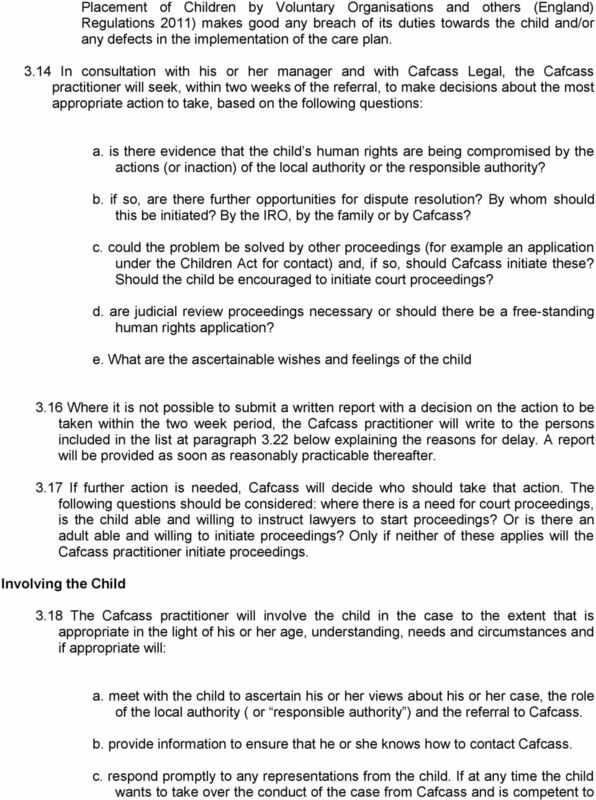 Cafcass will need the court s permission to disclose any documents filed in family proceedings in connection with judicial review or freestanding Human Rights proceedings. 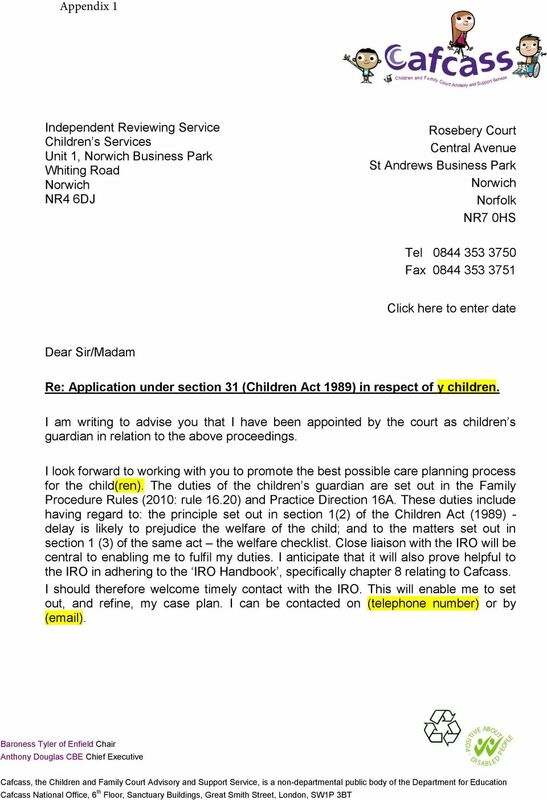 12 do so, the Cafcass practitioner will give as much help as possible including supplying a list of solicitors whom the child might wish to instruct. Legal Proceedings 3.19 If, on referral from an IRO and having consulted with his or her manager and taken legal advice, the Cafcass practitioner decides it is necessary to bring civil proceedings such as judicial review, or a free-standing application under the Human Rights Act 1998, he or she will take steps to secure appointment as the child s litigation friend The Cafcass practitioner must seek to start any such civil proceedings within six weeks of receipt of the referral. In some cases, the timetable will need to be much shorter due to the urgent nature of the concern. Even after proceedings have been issued, the Cafcass practitioner will continue to try to settle the case. Timetabling and Sharing Information 3.21 The Cafcass practitioner will at all times have in mind the principle that delay may be harmful to the child and will have regard to relevant limitation periods. He or she will write a report detailing with reasons the course of action to be taken in the case including, where appropriate, reasons for not taking any action requested by the IRO. The practitioner will seek to prepare the report within two weeks of the referral3.at the conclusion of the case whether by judgment of the court or after the case has been settled, the practitioner will provide a further report within six weeks of judgment or settlement4. That report will include the reasons for the decision to bring proceedings to an end, the reason for any delay in the time limits, the detail of any settlement and any other comments or recommendations 3.22 The reports will be sent to the following people: a. the child, depending on his or her level of understanding. b. the IRO. c. the Chief Executive of the local authority and the Director of Children s Services or equivalent. 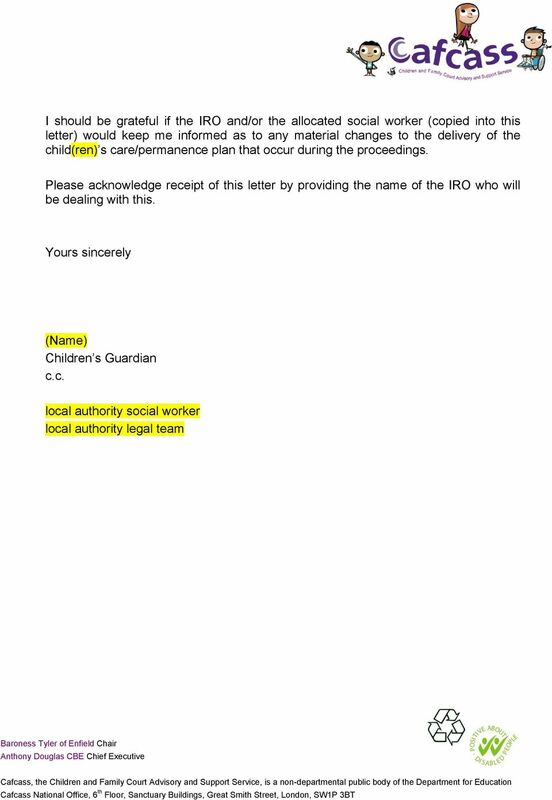 d. the Chief Executive or equivalent of the voluntary organisation of private children s home e. the social worker and their team manager with day-to-day responsibility for the case.. f. any other person the officer of the Service considers should be informed. The officer of the Service will take advice from Cafcass Legal for instance in relation to persons with parental responsibility. Making a complaint Information Guide This guidance is to assist disabled people and / or their family members who feel they may have received a less favourable service (discrimination) due to their disability. NB: Applicants must be informed that they will not be permitted to start if successful without two satisfactory references.